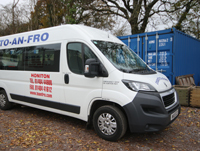 At To An Fro Honiton, Devon we specialise in vehicle rentals. We have a wide range of vehicles available for hire throughout the East Devon area, including cars, vans, lorries and minibuses. NEW 16 and 17 seater Minibuses that can be driven even if you passed your test after 1997 as long as you are over 25 and have held a licence for over 2 years. 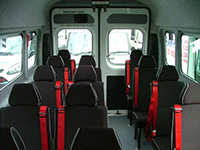 All of our minibuses are fitted with seatbelts. Whether you need a vehicle for a day out with the whole family, a wedding, hen and stag parties, weekends away or school trips then contact us at To AN Fro and we will be happy to help. 17 seats, all seats are fitted with belts. Vehicles are updated regularly therefore models may vary.